Posted on January 7, 2015, in Book Reviews, Classics Club, French authors and tagged Emile Zola, French classic authors, L'Assommoir. Bookmark the permalink. 21 Comments. This is my favorite Zola. I kept rooting for Gervaise all the way to the end. Once Lantier returned though, I figured it was all up with her. I read parts of this novel my first year here in France and found it fascinating but extremely sad. I will have to pick it up one day and read it from cover to cover. Nineteenth century literature has always been one of my favorite genres, especially during college. And Zola was a master of description. Have you read Nana yet? My daughter really liked it. She’s in her last year of lycée and is struggling through a second reading of Madame Bovary. She hates it! Lol! Oh dear, I loved that book. Has she tried Therese Racquin? No but I’m sure she’d like it better. I liked Madame Bovary too but to a 17 year old girl Emma Bovary comes of as a bit of a spoiled brat who doesn’t know what she wants. That’s all they can see at her age, if you get what I mean. This sounds so amazing. I have yet to read his novels, but I am going to see if my library has them! It could be the start of a beautiful new friendship! 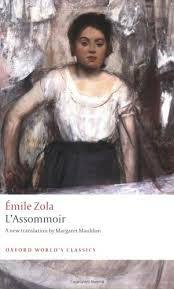 I had a Zola phase as a young man and read a lot of his books – I found L’Assommoir one of those which really made a lasting impression on me. Reading your review reminds me what a powerful book this is – you’ve inspired me to dig out my battered old copy for a re-read. Exactly so Col – they are books that once you’ve read them you can’t get them out of your head. I don’t think you could read all of them without a break – far too bleak for one thing but also I have a feeling the effect would be diluted. When you get to Nana, there’s a description of the bed she has especially made for herself. I don’t have that one – I can see I’m just going to have to buy them all.. I loved this novel and thought it one of the best in the Rougon-Macquart cycle. You might try The Kill (Zola) is you ever have time. Are you going to read Nana? I just bought The Kill and will certainly plan to read Nana now I’ve been introduced to her via Gervaise. I enjoyed La Bete Humaine but my favourite is by far Germinal.